Its such as a cliche but if there was ever one track that could fit into a variety of genres it has to be this. Pitch it down on -7 and you have a lovely driving proggy trancer demonstrated by Sasha & Digweed on their Independence 96 mix. Keep the track on 0 pitch and you have a lovely goa-esque trippy number as shown by Paul Oakenfold when he played this in 1996. However, crank that pitch up to +7 and this transforms into a hard trance rocker, capable of ripping a dancefloor to sheds as Mark EG did in 96, when pitched up this mixes well with Electric Universe stuff trust me. Essential purchase 5/5...and the rest!! Mahadeva, starting off with synth choir chorded melody, and chanting "Mahadeva". Soon thereafter, they introduce a characteristic rolling bassline, kind of Moog like. Eventually the choir chords stop and it develops into a deep 'doof' kickdrum with the bassline and percussion. The production itself sounds quite a bit ahead of it's time, the engineering is quite well done. It's an example of Astral Projection near their prime, it may be only 1995, but this is where the real original sound of Astral Projection began and was made so famous in the following albums to come. Lots of filtered synthesizer rhythms and melodies layered upon layer of other secondary melodies and rhythms of synthesizer work. The arragement is cleverly done, it builds in a very natural and linear fashion. Have a listen to the track on Youtube before buying, this is probably the start of the Astral Projection sound, (well, at least, as much as I've had the pleasure to hear.) If you enjoy these, i highly recommend their other earlier albums. "Trust in Trance - 1996", "Dancing Galaxy - 1997", and perhaps "Another World - 1999". These albums here will give you perhaps the best identification or example of Astral Projections famous Goa Trance sound and interesting scales and arrangement. This track here, Mahadeva, is very dancey, upbeat percussion and drum loop , coupled with a rolling bassline and several layers of synths playing their own melodies and melodic rhythms. Great track for what it was, and especially for it's time, it doesn't exactly sound like 1994, but even newer. It's great. i dont have enough words for describe this masterpiece, only i can say that this tune, is a pionner in goa trance music, the melody is so hypnotic and the basse combine with space sounds and the magnificent sample( mahadeva) make of this tune an anthem that will last forever! To confirm what Philatelist says, the track "In Novation" in the U Tube files on this page is not on this release. 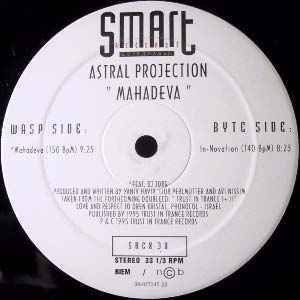 Rather it features on the Smart Records Copenhagen release also called "Mahadeva". Worth noting if you are seeking "In Novation" which for me is a finely balanced classic. Mahadeva is one of the all-time classic psy-trancers. It's quite fast, the bassline is heavy and dark, and the psychedelic synths only get more delicious as the track proceeds. It's a masterpiece, simple as that. a classic by the classics!! Its hard to describe the way this tune swept away all those who heard in amazement at the time. Turning many new ears onto the Goa scene, The opening pounding bass line and vocal chant turned parties into wide eyed, wide smiling euphoria. Still sounds better than anything that has come since in my opinion, and heard under the starts in Anjuna, totally unforgetable and unbeatable piece of sonic magic. The Original version is without one of the all time greatest psy-trancers. It's one of those records that simply demands that you take to the dance floor. The spiritual aspect is present by the addition of Hindu chants and a high 'Ohm' factor.